Join Rick Sammon and Ken Koskela in the Patagonian region of Chile and Argentina in November, 2017... during Springtime! Words simply cannot describe the landscape you will experience while there. 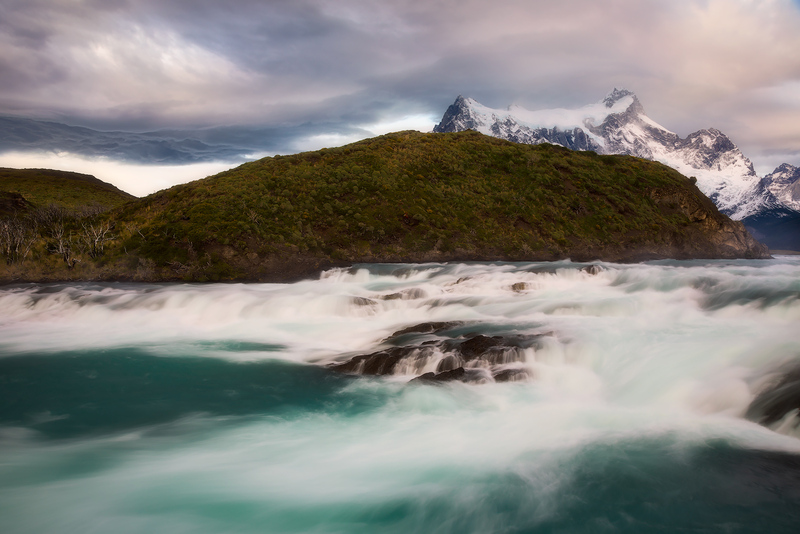 In Chile’s Torres Del Paine National Park, we will photograph the stunning peaks of "Los Cuernos" and Cerro Paine Grande with beautiful turquoise waters and white rapids in the foreground. 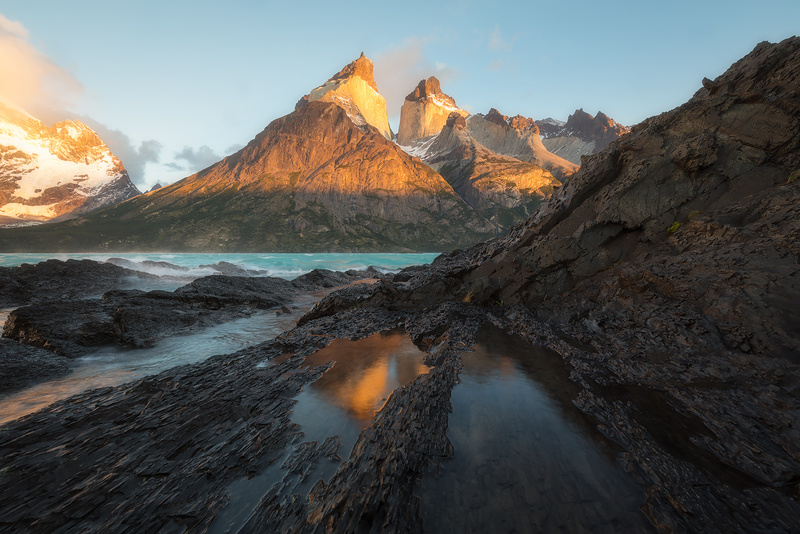 In Argentina, we will stand in awe of Mount Fitz Roy and photograph from vantage points in Los Glaciares National Park. A highlight of the trip will be experiencing amazing blue glaciers that have to be seen to be believed. Although we will stay in hotels during the main tour, we are offering an optional 2-day backcountry camping add-on in Argentina, allowing for closer vantage points of Mount Fitz Roy and Cerro Torre. We hope you will join us! Day 1 (November 3, 2017) - We will begin our adventure in El Calafate, Argentina, a smaller city catered for visitors, with plenty of shops and restaurants. If you choose to arrive a day early (on November 2), this is a good place to rest up and enjoy the city prior to the tour. On Day 1, we will meet in our hotel lobby at 6:00 pm and head to a nearby restaurant for a welcome dinner and to talk about the upcoming tour. Days 2-5 (November 4-7) - We hop in our vans and head to Chile's Torres del Paine National Park, approximately 6 hours away including the border crossing. Our hotel is perfectly situated on a small island on Lake Pehoe and has one of the most classic views in all of Patagonia. You will literally be surrounded by turquoise waters with a perfect view of the iconic Los Cuernos and Cerro Paine Grande. We will arrive well in advance of sunset to check in and photograph this incredible mountain range for the first time. During the next several days, we will focus on scenes that include Los Cuernos and Cerro Paine Grande, positioning ourselves near Salto Grande, Lago Nordenskiöld and the shores of Lake Pehoe. 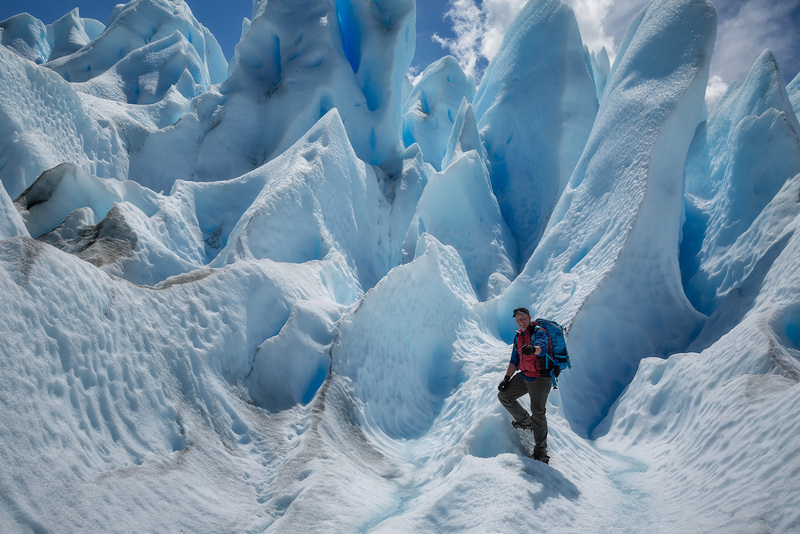 On one afternoon, we will head over to Lago Grey to experience and photograph a glacier up close. Because nights will be short, we will allow ample time during the day to ensure that we get adequate sleep, but also spend time learning a variety of landscape post-processing techniques. Days 6-7 (November 8-9) - After photographing again at sunrise, we have breakfast, board our vans, say goodbye to Chile and head to Argentina for the balance of the tour. 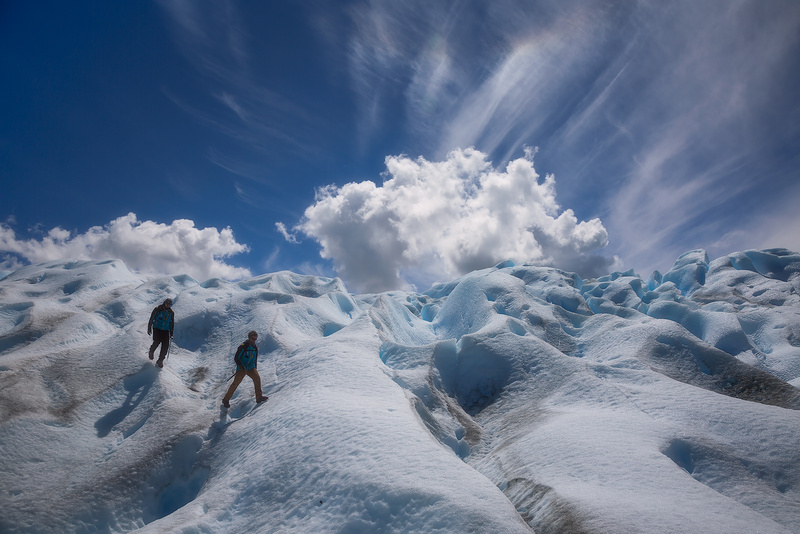 Our first stop here is the incredible Perito Moreno Glacier. If you meet local age restrictions of 65 and under, you will have the opportunity to hike on the glacier. As an alternative, you can experience it up close by boat. Either way, you will be in awe of this incredible landscape. We will then make the drive to El Chalten, Argentina, where we will be based for the balance of the tour. 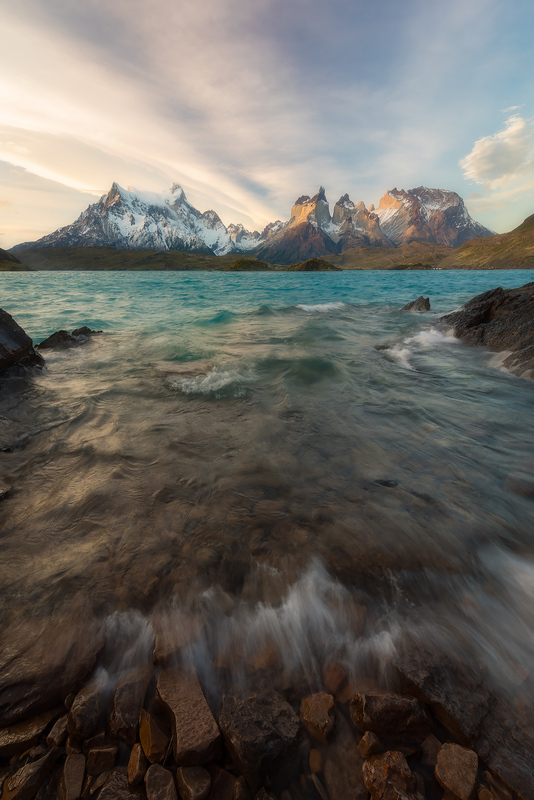 Days 8-9 (November 10-11) - Here, we will focus on photographing the incredible Mount Fitz Roy and surrounding mountains from a variety of vantage points, with moderate hikes to locations that present foreground elements and the best photographic opportunities. A couple of the hikes for this part of the tour will be short to moderate (about 60-90 minutes each way, with some uphill hiking). The more strenuous hikes will be included in the optional add-on. 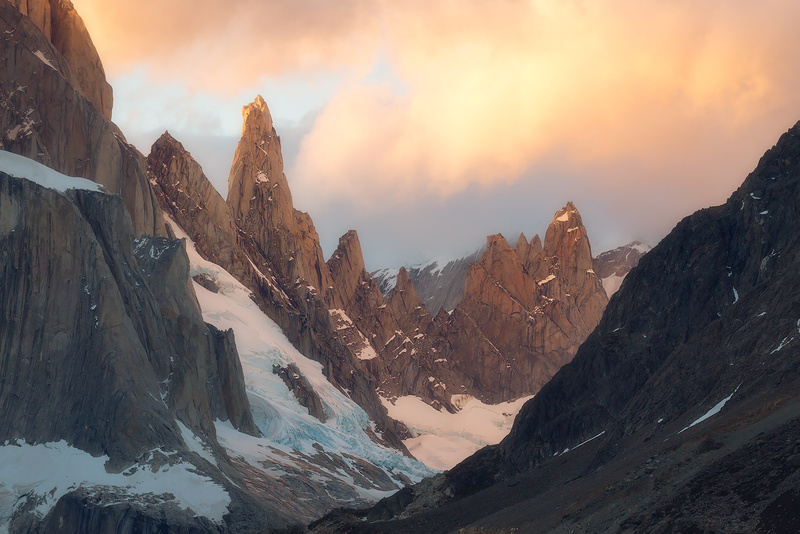 During this time, we will be based in the town of El Chalten, the closest town to Fitz Roy. We are literally at the base of the trails leading to the mountains. El Chalten makes for a good base and has a variety of restaurants, coffee shops, and some limited shopping. Day 10 (November 12) - This morning, the entire group will hike to our sunrise location. Those individuals not doing the add-on will then hike back to El Chalten with our guide and have some limited time back at the hotel before boarding the van for El Calafate, arriving there approximately 2:00 pm. You can choose to catch an evening flight home or stay the night at your own expense in El Calafate and fly home the next day. 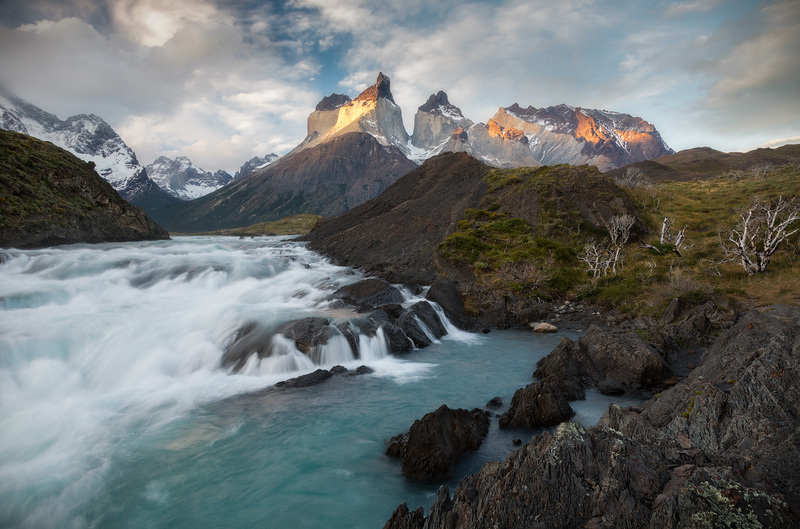 Those doing the add-on will begin that portion of the tour by continuing the hike towards Mount Fitz Roy. Add-On (Extra Cost): Days 10-12 (November 12-14) - If you are physically fit and up for the challenge, participating in this add-on can yield some great photographic rewards and be a truly unforgettable experience. The first night will be spent camping near Rio Blanco, much closer to the base of Mount Fitz Roy. 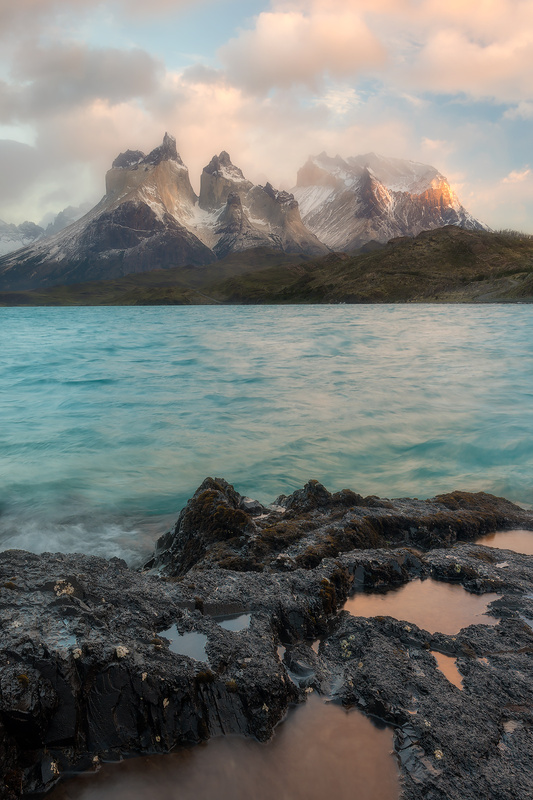 You will have two options for our first sunrise: 1) make the 300 meter hike up to Laguna De Los Tres, a perfectly situated lagoon at the base of Fitz Roy that can capture some great reflections of the mountains. Or, 2) hike to one of a couple other outstanding locations that are more easily accessible. We will then break camp and move onto our second location, the beautiful Laguna Torre, with Cerro Torre in the background. 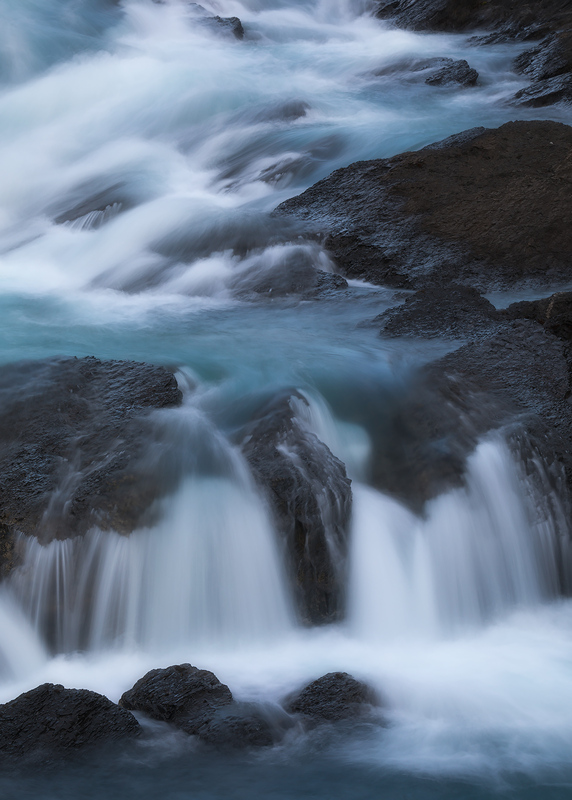 If the lagoon cooperates, we will have beautiful blue icebergs scattered throughout to use as foreground elements. After this sunrise shoot, we will break camp and hike back to El Chalten. All in all, this add-on portion of the tour will involve approximately 20 miles (32km) of hiking over a period of 2 days, carrying our camping and photography gear. The campgrounds we stay in are national park campgrounds and have no services, other than an outhouse. We will bring our own food in. After arriving back in El Chalten, we will stop at our hotel to freshen up before hopping in the vans and heading back to El Calafate, with an estimated arrival there of around 5:00 pm. You can arrange your flights any time after 7:30 pm or stay one last night in El Calafate and head home the next day. See section on physical requirements below. Although this workshop is open to photographers of all skill levels, at least some experience with landscape photography will go a long way. At minimum, you should be familiar with your camera's controls and understand the basics of composition. You should bring lenses in the wide-angle through telephoto range to capture the myriad of photographic opportunities in this region. We will be teaching post-processing on Photoshop and Lightroom, so bring your laptop. Bring enough memory cards... I suggest at least 100 gigs or more. Bring extra camera batteries and, as always, a tripod. You will also need to be equipped properly for hiking, including protection against heavy wind and rain. Those participating in the add-on will need camping equipment, including a 1-2 person tent, sleeping bag, air mattress and portable cookstove to boil water (although these can be shared if you don't have one). We will send out a more complete equipment list to participants or upon request. Making your air arrangements - The group will meet for a welcome dinner at 6:00 PM at the lobby of our hotel in El Calafate, Argentina on November 3, 2017. El Calafate's airport code is FTE. From Buenos Aires, Argentina, the flight is about 3 1/2 hours. However, note that an airport change is required in Buenos Aires. You will fly into the international airport (airport code EZE) and then hop in a taxi to the domestic airport, which is Jorge Newberry airport (code AEP). Although the transfer by taxi is easy, you should allow at least 4 hours layover in Buenos Aires. Once you arrive in El Calafate, your hotel is an easy taxi ride away, which you can either arrange yourself or we can help with your arrival. Also, we suggest arriving a day early in El Calafate to rest up and enjoy the city. Although the one night hotel will be at your expense, we can help arrange it for you. We will travel on a combination of paved highways and, once in the national parks, dirt roads with stones and plenty of potholes. For those not participating in the Optional Add-On, you will be arriving back in El Calafate by 2:00 pm on November 12th, so book your flights any time after 4:30 pm. If you would like to or need to stay an extra night in El Calafate, we can help arrange the hotel which would be at your own expense. For those participating in the add-on, we will return to El Calafate by 5:00 pm on November 14th, so you can book your flight back after 7:30 pm on November 14th or fly back the next day. We can help arrange a hotel the night of the 14th, which would be at your own expense. IMPORTANT - This tour requires you to be physically fit. For the base tour, a number of shooting locations require very little walking. However, we will do about 3-4 hikes that will be in the range of 2 hours or more and involve walking up and down hills, including in the dark by headlamp. And, yes, the rumors are true that the winds can be pretty intense there. Additionally, sunrise is early and sunset is late, so we will be relying on some downtime during the day to get adequate sleep. For those interested in the add-on, this will involve 2 days of backcountry camping (no services, other than outhouses) and approximately 20 miles (32 km) of additional hiking while carrying our photography and camping gear. REQUIRED TRAVEL INSURANCE - For this trip, you are required to purchase emergency medical treatment and medical evacuation insurance, and provide us with a copy of the policy. We require this for your own protection in the unlikely event that you need help while on the trip. Deposit - USD 1,500 and a completed registration form reserves your spot. Important - See "Tour Policies" (link below) for information on payments and refund policy. Price Includes - Accommodations (sharing in double room unless single supplement paid), welcome dinner and farewell dinner, all breakfasts, all local transportation including airport transfer, park entrance fees, photo instruction & critiques.